We all love pasta and red sauce, don’t we? So often, though, we’re tempted to take the shortcut and just buy a jar of sauce at the store. While that’s fine and dandy, we can really do so much better. This chunky, meaty Bolognese or spaghetti sauce recipe is something you’ll make again and again. Wanna know a little secret? It’s fairly easy to make, too. Takes some time, but it’s sooo worth it! This spaghetti sauce recipe makes a lot of sauce. Luckily, it freezes beautifully, so you can pack some away for a weeknight meal. You’ll want to use at least a 6 qt stock pot or dutch oven. While it’s delicious the day it’s made, the chunky Bolognese sauce is even better after it sits for a day or two. You should be able to get Parmesan rind at your deli counter. This easy to make meat Bolognese or Spaghetti sauce is simple, even though it takes a while. It makes a lot too, so you can freeze or can leftovers. In a large (6 Qt) Dutch oven or stock pot, heat olive oil over medium heat. Add onion, garlic and mushrooms to pan and cook until onions become soft and mushrooms begin to release liquids, about 4 or 5 minutes. Add celery, carrots and ½ cup wine and continue cooking for 3-4 minutes. Add crumbled beef and pork to pot and cook over medium heat until no longer pink inside. Remove from heat and carefully drain excess fat from pan. Return to burner and add tomato puree, petite-cut tomatoes, tomato paste, and remaining red wine to Dutch oven, along with oregano, thyme, rosemary, and sugar. Stir to combine. Drop in bay leaves and Parmesan rind and give a quick stir. Cover and simmer on low heat for 3-4 hours, stirring occasionally. If sauce is too thick, add a little water to achieve the desired consistency. If it is too thin, continue cooking until it reaches the thickness you prefer. Remove bay leaves and Parmesan rind. Season with salt and pepper, to taste. Serve immediately with your favorite cooked pasta and some cheesy garlic bread. Refrigerate or freeze unused portion within 2 hours. See how easy that is? It’s time consuming, but not difficult. 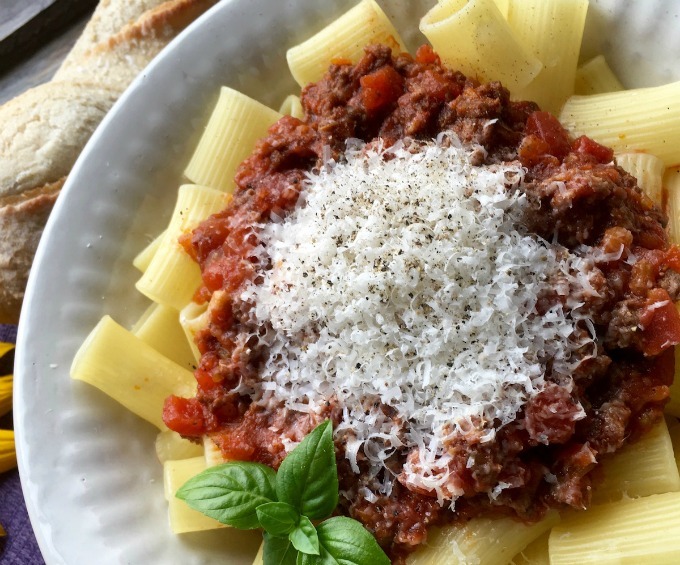 Making easy Bolognese sauce is a great way to spend a rainy day at home. Plus, you have something amazing to show for your efforts. 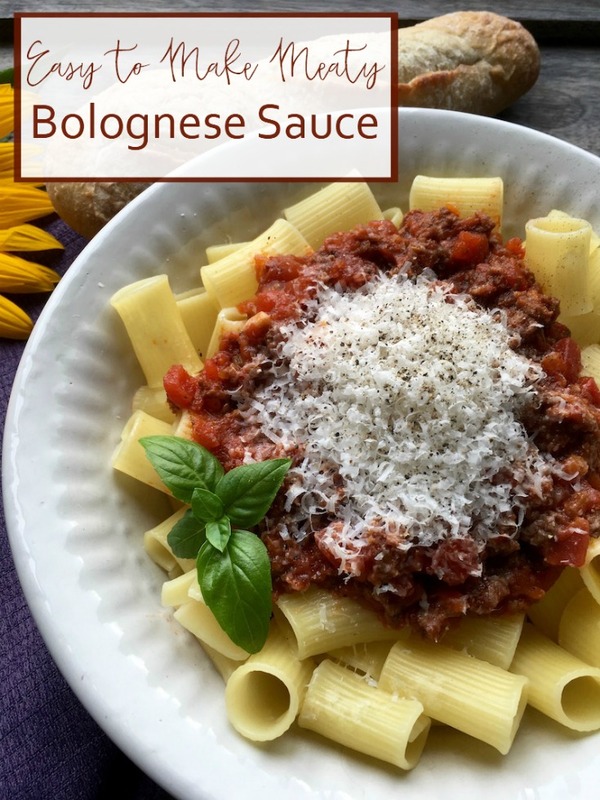 Serve this delicious spaghetti sauce recipe with your favorite pasta, top liberally with good freshly grated cheese, and some really tasty cheesy garlic bread. It’s a total comfort meal in a bowl, and perfect for cool weather.